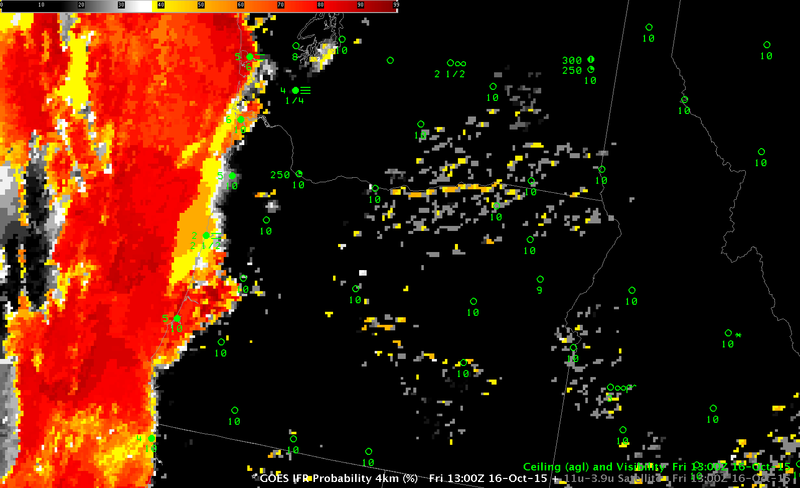 Fused Data is beneficial in the detection of low ceilings and reduced visibilities. Consider the region in northeastern Oklahoma where cirrus has overspread low clouds and dense fog is reported on the ground. The satellite view of the low clouds is obscured by the cirrus; the brightness temperature difference signal is not one associated with fog/low stratus. However, GOES-R IFR Probability fields maintain a signal because Rapid Refresh model output is used; saturation is occurring in the lowest 1000 feet of the model over eastern OK, and the GOES-R IFR Probability is larger there as a result. (Dense Fog Advisories were issued for this event). This entry was posted in Multiple Cloud Layers, Plains on October 28, 2015 by Scott Lindstrom. Dense fog formed over western North Dakota early in the morning of Monday 26 October (and advisories were issued). At the same time, cirrus clouds overspread the region, making satellite detection of the low clouds problematic. This is an excellent example of the benefits of a fused product that blends surface and near-surface information from numerical models with satellite detection. When one of the products gives no information, the other can be relied upon to fill in gaps. In the example above, dense fog develops over western North Dakota, complete with freezing drizzle. 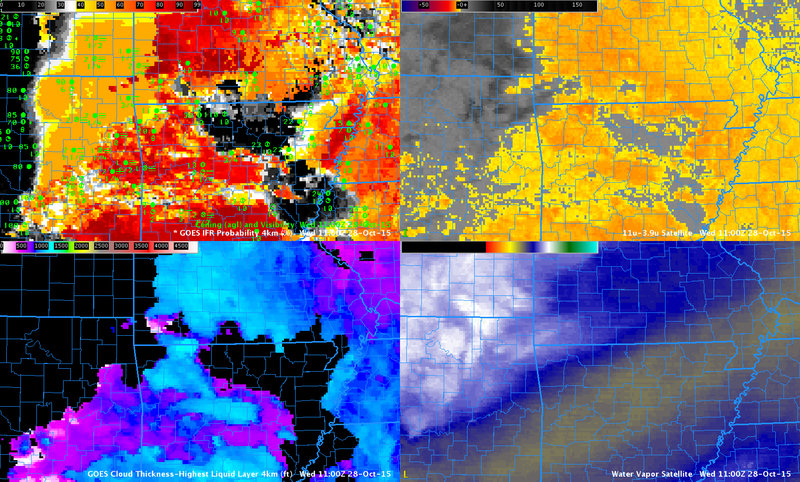 Satellite detection of the low clouds on this date was difficult because of widespread cirrus that overspread the state; these cirrus are apparent in both the water vapor (lower right) and the brightness temperature difference (upper right). When model data principally are used to compute the IFR Probability fields — in regions where high clouds prevent a satellite view of low clouds — the character of the field is flatter and less pixelated. In addition, where high clouds cannot view low clouds, the Cloud Thickness cannot be computed (as it relates 3.9µm emissivity to cloud thickness). Note that there are regions where the cirrus thins enough that low clouds can be viewed — in these regions the Cloud Thickness is computed an the IFR Probability increases (where both Cloud Predictors and Model Predictors can be used, IFR Probabilities are larger). This entry was posted in Multiple Cloud Layers, Northern Plains on October 26, 2015 by Scott Lindstrom. The GOES-R IFR Probability fields over Oregon and Washington on the morning of 16 October 2015 correctly diagnose low ceilings and reduced visibilities along the coast, even when high clouds intervene at the end of the animation above (especially evident at 1300 UTC, below). In addition to marine stratus that is reducing visibility/ceilings along the coast, surface observations suggest a valley fog is forming in/around Centralia/Chehalis Washington (KCLS). However, GOES-based IFR Probability fields do not become enhanced in that area. Why not? The valley of the Chehalis River, in which the fog is forming, is far too narrow to be resolved by GOES-15, which satellite has 4-km pixel sizes at the sub-satellite point. (Pixels are closer to 6 km in size over southern Washington). Higher-resolution MODIS data (with a 1-km pixel size) can be used to create GOES-R IFR Probabilities, and MODIS overpasses viewed Centralia/Chehalis at 0650, 0924 and 1105 UTC. The imagery below toggles between MODIS-based and GOES-based GOES-R IFR Probabilities at those times. Even as early as 0645 UTC, the MODIS-based IFR Probability fields are suggesting that a fog is starting to develop. At later times the MODIS-based IFR Probability values are much larger than the GOES-based values. MODIS data can give an early alert to the development of small-scale fog. This entry was posted in MODIS, Pacific Northwest on October 16, 2015 by Scott Lindstrom. Dense fog formed over south Georgia early in the morning of 9 October 2015 (National Weather Service Homepage in Peachtree City). The imagery above, from 1115 UTC, demonstrates a strength of the GOES-R IFR Probability field: it maintains a signal where dense fog is ongoing even as high clouds overspread the region. At 0800 UTC on 9 October (below), high clouds had not yet overspread south Georgia, and the image below shows that both IFR Probabilities and Brightness Temperatuere Difference fields outline the region of developing fog. When high clouds appear (as in the image above), the Brightness Temperature Difference signal that can be used in clear skies loses its utility in fog detection. This entry was posted in Deep South on October 9, 2015 by Scott Lindstrom. FOG ADVISORY…WHICH IS IN EFFECT UNTIL 10 AM CDT THIS MORNING. * TEMPERATURES…IN THE LOWER 30S. * VISIBILITIES…AREAS OF VISIBILITY UNDER ONE QUARTER MILE. VISIBILITIES WILL BE HIGHLY VARIABLE HOWEVER. * TIMING…FOG WILL BURN OFF MID MORNING. The GOES-R IFR Probability fields increased in this region as the fog developed (above). Notably in this case, IFR probabilities were lower over Minnesota and the Red River Valley where mid-level stratus was occurring. The toggle below compares IFR Probabilities and Brightness Temperature Differences at four times during the night. The Brightness Temperature Difference fields (animation from 0400-1100 UTC is here) greatly overpredict the region of dense fog. Because the IFR Probabilities incorporate information about the surface, however, regions of mid-level stratus can be screened out. These are regions where the Rapid Refresh model does not show saturation in the lowest layers. Note that Cirrus is overspreading the region from the west at the end of the animations. High Clouds change the signal in the brightness temperature difference field. Harvey ND at 1100 UTC reports Zero visibility and an obscured ceiling (with freezing drizzle). The station is under cirrus, however, so a brightness temperature difference signal associated with fog is not present. There is a modest IFR Probability value there because data from the Rapid Refresh suggests low-level saturation is occurring. This entry was posted in Northern Plains on October 9, 2015 by Scott Lindstrom. Fog developed over Indiana and surrouding states (again) on the morning of 6 October, and the animation above traces that development as diagnosed by GOES-R IFR Probability fields. Multiple cloud layers over the region meant that the Brightness Temperature Difference field, a traditional method of low cloud detection (that keys on the differences in emissivity at 10.7 and 3.9 in water-based clouds) could not be used because low cloud detection was hampered by the presence of high clouds. The fused product, GOES-R IFR Probability, provides useful information by combining Rapid Refresh Data information about low-level saturation with satellite fields. When satellite information about low clouds are missing, as in this case, model data provides a signal. Because multiple cloud layers exist, the GOES-R Cloud Thickness Product (that diagnoses the depth of the lowest water-based cloud based on an empirical relationship between 3.9 µm emissivity and cloud depth developed using sodar observations off the West Coast of the United States) is not produced over much of the region. It is also not produced at times of twilight — such as those that occur at the end of the animation. There are values over southeastern lower Michigan at the start of the animation, where high clouds were not present. Low IFR Probability is also shown in the animation above (Lower Left figures). The small values in this case suggest any fog is unlikely to be producing visibilities less than 1 mile or ceilings less than 500 feet. This entry was posted in Low IFR Probability, Midwest, Multiple Cloud Layers on October 6, 2015 by Scott Lindstrom. 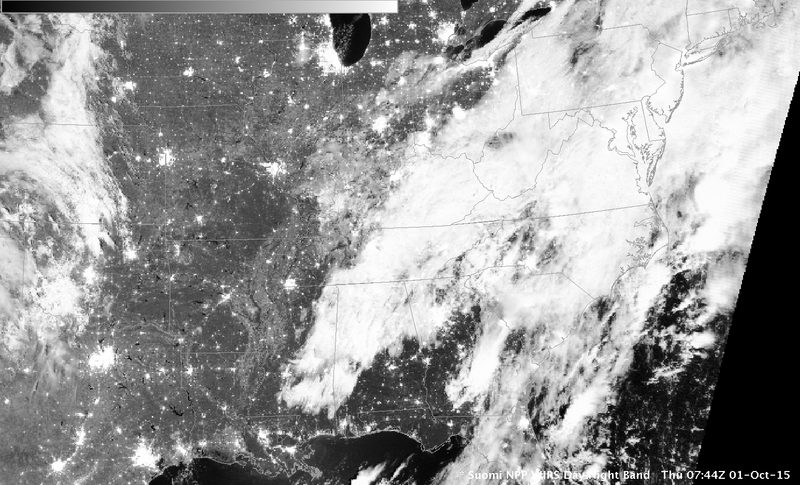 When thick clouds are present, as along the East Coast of the United States early on 1 October 2015, as depicted by the Suomi NPP Day Night band (0.70 µm) image above, satellite detection of low clouds is problematic. This is why GOES-R IFR Probability fields incorporate information from model data so that useful guidance can be produced on whether IFR Conditions exist. IFR Probabilities increase slowly over coastal South and North Carolina after midnight on 1 October — and the fields do a good job of outlining where IFR Conditions are occurring. In most locations, at most times, the fields are not pixelated. The smooth nature arises when model fields (which are relatively smooth) are used (and satellite data that are more pixelated are not used) to generate the IFR Probability Fields. Some holes in the extensive cloud cover occur over North Carolina during the animation: the IFR Probability field takes on a more pixelated appearance when that happens — and the Probability value increases when satellite data can also be used as a Predictor. The GOES-R IFR Probability field at 1145 UTC includes a north-south oriented artifact. To the east of the obvious line, day-time predictors are used in the GOES-R IFR Probability computation; to the west, night-time predictors are used. One of the daytime predictors is Visible Imagery that is used to cloud-clear more accurately. The IFR Probability where daytime predictors are used is larger because there is more confidence that a cloud does exist. This entry was posted in Deep South, Mid-Atlantic on October 1, 2015 by Scott Lindstrom.